Some years back, a Facebook friend posted some rather stunning photos of his vacation in Ao Nang, Krabi, Thailand. 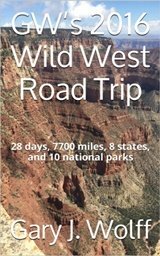 Ever since, I've had it on my bucket list and in February 2017 I finally got my chance to go visit. Ao Nang was the 11th stop in my tour of beautiful Pacific islands, starting with Guam back in 2007. 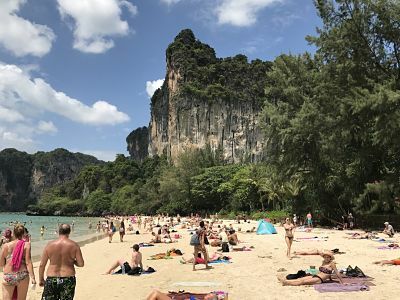 Technically speaking, Ao Nang is not an island nor is it in the Pacific, but as a resort town in southern Thailand's Krabi Province and best known for Ao Nang Beach, it serves as a busy hub for long-tail boat tours to the beautiful nearby beaches and islands in the Andaman Sea. 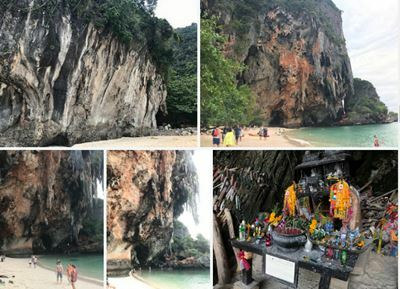 These include Railay Beach, a well-known destination for rock climbers, and Phra Nang Beach which contains a cave with a very interesting... ahem... phallic shrine to a princess goddess, as well as some of the most stunning karst limestone beachside stalactites I've ever seen in my life. 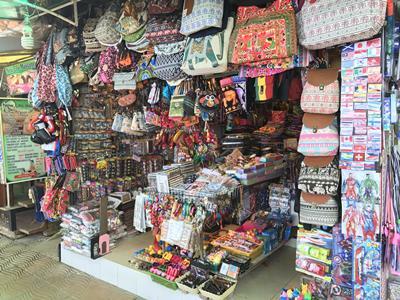 Tours and transport to nearby islands is also a HUGE business in Ao Nang, including half-day and all-day tours, e.g. 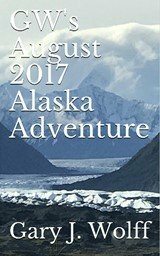 the 4-island tour I took, as are the industries catering to diving, snorkeling, and sea kayaking trips. 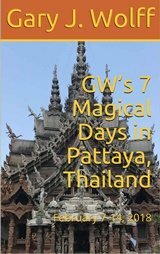 There are also high-speed ferries to & from Phuket, only 50 km (30 miles) to the west. 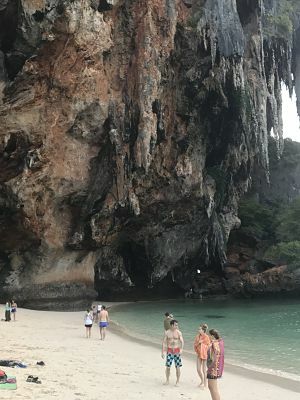 On this page, I will share some of the more memorable highlights of my 5-day Ao Nang, Thailand travel adventure, including the 8-hour, 4-island long-tail boat tour I took, my hike up Ngorn Nak Mountain, some stunning sunsets, fire dancers, live music, and my 1st-ever chance at nighttime snorkeling to observe bioluminescent plankton. Wow! This 4-island boat tour, run by Thalassa Boat Tours and which I booked online before leaving Japan, was by far the most exciting thing I did in Ao Nang. Lasting from 12-8 pm, we first visited West Railay Beach, a short walk across the peninsula from East Railay Beach which is famous for rock climbing; then Poda Island, where we enjoyed a delicious Thai lunch buffet right on the beach; and Tup Island, which during low tide is connected to Chicken Island at low tide by a narrow sandbank you can walk across in less than a minute. Back in the boat, we rode around Chicken Island, where we could see the island’s incredible rock formation in the shape of a chicken. The tour also included 2 snorkeling opportunities, 1 during the day and the 2nd at nighttime to see the incredible bioluminescent plankton. This was a truly AMAZING experience.... the 1st time in my life... where simply by shaking your hands or feet underwater, you could set off a swarm of what appeared to be fireflies in the water. Too bad I couldn't capture the bioluminescent plankton on film, but the portion of the video below I found at YouTube where the guy is running his hand through the water is very similar to what we experienced with our own eyes on this tour. The only difference is that the color we observed was more like a firefly shade of green rather than the bright blue in this video. The 4-island tour set me back 2500 baht (~$70), which included ground transport to & from the boat, snorkeling equipment, buffet lunch on the beach, club sandwich snack dinner at sunset, fresh fruit, ice cold soda, bottled water, and beer, insurance, plus the 400 baht per person national park fee. My 6 video clips of this 4-island, long-tail boat tour, including the cute monkeys I saw on Phra Nang Beach can be viewed starting at the 1:12 mark in my video below. While in Ao Nang, I also had the opportunity to climb the highest peak in the area, Ngorn Nak Mountain. 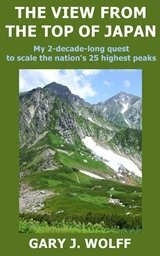 It was a fairly easy, 3.7-km, 2-hour trek, gaining nearly 500 meters in elevation. 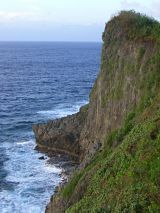 This peak is part of a rainforest and lies in a national park, so the scenery was very green and lush. Even though it was a tad hazy that day, the views of the beautiful Andaman sea and the surrounding Krabi countryside from the summit were to die for. 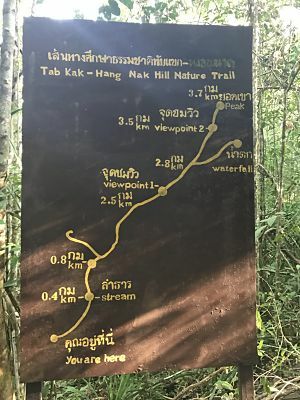 Not only was this hike very invigorating and beautiful, but another exciting part of this back-to-nature adventure was the 30-min., 3-wheeled tuk-tuk ride from Ao Nang Beach to the Ngorn Nak Mountain trailhead. The nice lady who drove me there was kind enough to come back and pick me up 4.5 hours later. You can view this tuk-tuk ride at the 7:20 mark in my video below. 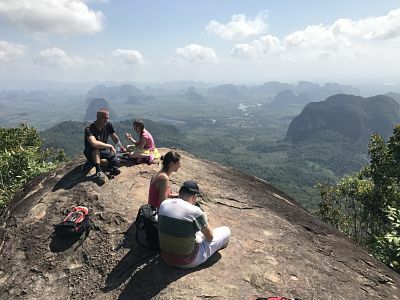 If you ever find yourself in Ao Nang and would like to climb this peak, I found a very helpful free Ngorn Nak Mountain hiking guide prepared by a lady named Joy B. at seekrabi.com. 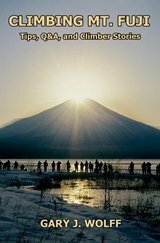 I was very pleased with my 6-night stay at The Verandah Hotel, which I reserved online at Expedia Japan. 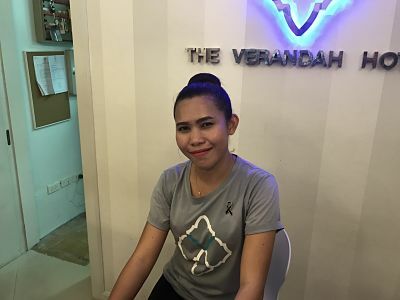 The Verandah is located on the main road to Krabi Town, only a 5-min. 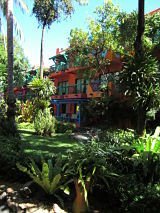 walk from Ao Nang Beach, and features a chic, Moroccan-style decor. When I booked my hotel reservation, I requested a double bed and so before I arrived, they moved my room's 2 twin beds together to make a king-size bed! Wonderful! 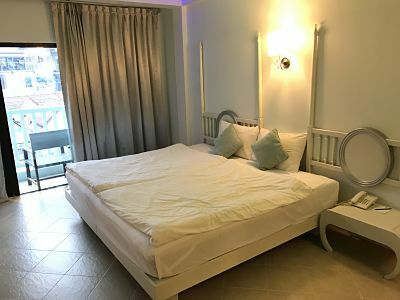 My Superior Room package included free wifi, in-room safe, refrigerator, coffee maker, free bottled water, 32-inch plasma TV with cable, and their amazing western-style, all-you-can-eat breakfast buffet cost only 250 baht (~$7). By comparison, the Sausage & Egg McMuffin set at the nearby Mickey D's cost 180 baht. There's no pool there, but through a special arrangement with their next-door sister hotel, the Peace Laguna Resort, guests staying at The Verandah are entitled to use the 3 gorgeous pools there for free, which I happily took advantage of on 3 separate sunny afternoons. Finally, I'd like to especially thank from the bottom of my heart the very cordial front desk staff Dida and Bee, who were exceptionally kind and helpful to me during my entire stay, never tiring of my million questions. Ao Nang in many respects reminded me of my trip last February to Boracay, Philippines with all the nightlife establishments and shops along Beach Road. A number of the restaurants are literally set up right next to the beach, e.g. the Mum-aroy Beach Front Restaurant where I had dinner and filmed an awesome sunset my last night in Ao Nang. As was the case in Boracay, bars and restaurants have live music which you can enjoy just by walking down Beach Road. I never saw a shopping mall, per se, but there are souvenir shops, currency exchange shops, tour companies, massage spas, boutiques, tailor shops, etc. virtually non-stop, both along Beach Road and the Main Road back into Krabi Town. My 2 favorite places for live music were Crazy Gringos Tex-Mex Restaurant where I heard the excellent South African band Ricardo and The Beach Bar where I heard solo artist Jimmy Patrick Roche from New York. You can see these 2 groups in my video below at the 12:38 and 26:18 marks, respectively. And as an American living in Japan, I was pleased to see a number of familiar places like McDonald's, Burger King, 7-11s, and Family Marts. Oh, and I was very lucky to catch the very impressive fire dancers at the Golden Beach Resort's Sat. night Fire Show. Those dancers were very impressive with the twirling of their fire batons. You can see them in action at the 15:52 mark in my video below, first a solo dancer on stage and then 3 fire dancers on Beach Road. I was surprised to see all of the Indian restaurants, whose ever-present, borderline-pesky staff were always on the sidewalks trying a bit too hard to coax customers into their shops with "special deals." Actually, the closest I came to eating Indian food in Ao Nang was a wood-fire baked garlic pizza in an Indian restaurant. There's a Tesco (the global British supermarket chain) on the left side of the Main Road back into Krabi Town, but it's a bit too far for walking (nearly 2 km from Ao Nang Beach), so if you want to go there, you'll probably want to take a tuk-tuk. 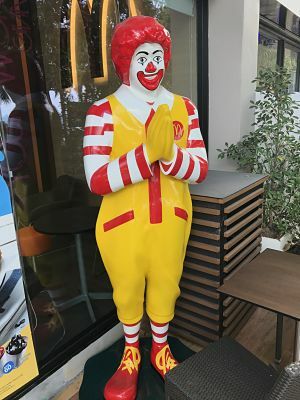 A better option is the 24-hour Mother Marche grocery store on the right side of the Main Road into Krabi Town, and which is much closer to Ao Nang Beach, definitely within walking distance and not far past McDonald's. Oh, by the way, don't miss the cute English-speaking bird in my video below at the 22:22 mark. SO precious! He can even make a cat call whistle. The images in the collage below are just a small sampling of the 178 pics in My Ao Nang, Thailand travel adventure photo album hosted at Flickr. Clicking on the collage below will open up the Flickr album on a separate page. I hope you enjoy them! It was a magnificent trip and I was blessed to have sampled so much of the amazing Ao Nang, Thailand culture & beauty.... especially the wonderful people. I hope this video helps you catch a quick glimpse of this spectacular tropical Asian paradise. Don't miss out on the beautiful time-lapse sunsets, the 4-island tour on a long-tail boat, my hike up Ngorn Nak Mountain, the tallest peak in the area, the rock climbers on East Railay Beach, fire dancers at the Golden Beach Resort, live music, and even an English-speaking talking bird! If you've ever wondered exactly where Ao Nang, Thailand is located, it lies on the west coast of Krabi Province in southern Thailand, about 650 km (400 miles) south of Bangkok, 50 km (30 miles) east of Phuket, and less than an hour by speedboat from the Phi Phi Islands where Leonardo Di Caprio's 2000 flick "The Beach" was filmed. Ao Nang, Thailand is located @ approximately 8° N latitude and 99° E longitude, and is only 2 hours behind Japan (UTC +7 hrs). To get a better feel for Ao Nang's location, you can zoom out in the Google map below, or click open a larger Google map on a separate page. Also, if you have Google Earth installed on your PC & are skillful using GE's tilt, rotate, & zoom features, in the larger map you can check out the 3D view & actually fly around Ao Nang as if you were in an airplane. What a great, exotic place Ao Nang, Thailand is! I was very impressed with not only the gorgeous scenery, but the very cordial & heartfelt Thai people as well, who so graciously shared their own slice of paradise with me. My 5 days in Ao Nang passed by TOO quickly, and I hope I'm blessed with another opportunity to return someday. Before leaving, if you get a chance, in my video above you'll definitely want to check out the 3 gorgeous sunsets that I filmed...... time-lapse video clips made with my iPhone, as well as a number of still shots that you can see in my Flickr photo album. 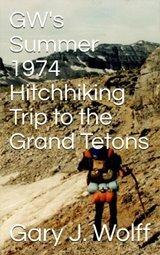 I hope you found this page both informative & entertaining, and that it will benefit future visitors to this "Pacific" paradise. It is also my hope you will find time to check back again soon to my Ao Nang, Thailand travel adventure page as I update it in the future with even more details.